■ Standing water and an energy source. ■ Five basic elements: carbon, oxygen, hydrogen, phosphorus and nitrogen. ■ And time, lots of time. In its search for environments where life might have started on Mars, the Curiosity rover has found the standing water, the energy and the key elements with the right atomic charges. 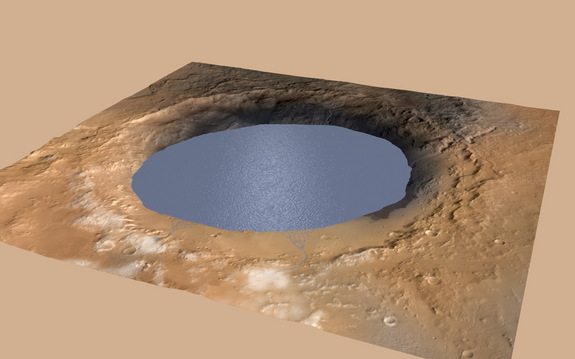 Rover’s yearlong trek to Mount Sharp provided strong new evidence that Gale Crater had large lakes, rivers and deltas for millions to tens of millions of years. A giant crater on Mars may have been able to support microbial life for millions of years in the ancient past because it was once a huge lake of water, new results from NASA's Curiosity rover suggest. Curiosity found evidence for the crater lake on Mars in the 96-mile-wide (154 kilometers) Gale Crater, which the rover has been exploring since its August 2012 touchdown. Today, Gale Crater is a dry, stark landscape, but in the ancient past, runoff from the crater rim created a lake in which deposited sediments gradually built up Mount Sharp, a mountain that rises about 3.4 miles (5.5 km) high from the crater's center, mission scientists added. "This lake was large enough it could have lasted millions of years — sufficient time for life to get started and thrive, sufficient time for lake sediments to build up and form Mount Sharp," Michael Meyer, Mars Exploration Program lead scientist at NASA Headquarters in Washington, said during a press conference on Dec. 8.